Today we’d like to introduce you to Califia Hurtado. Califia, we’d love to hear your story and how you got to where you are today both personally and as an artist. Messy. Cluttered. Disaster desk. Most people share their workspaces on Instagram or Facebook because they’re organized and beautiful, but for some reason, I have always found it far easier to create when there is clutter around me. No matter how much I try to keep my workspace (and in truth, my home) organized, I always fall back into a weird sort of comfortable clutter. It’s almost an embarrassment. Despite that, my most time intensive, intricate, and beautiful pieces have arisen during the most cluttered times in my life. My whole life I have been a creator of art, and I have dabbled in nearly all forms of art. I had the encouragement of a marvelous art teacher, Shally Brady, who now lives in San Antonio. Thanks to her unbridled joy, I found that permanent passion for art and experimentation that nobody could take away from me. I have written poetry and lyrics, drawn with graphite and colored pencils, painted with acrylics, worked on artistic collages, and done a touch of sculpting with polymer clay and regular clay. 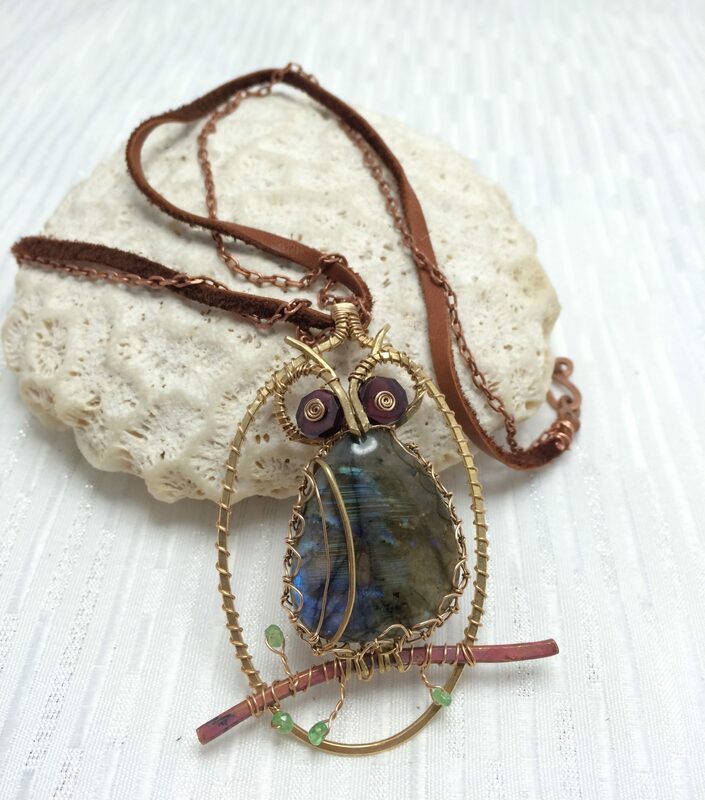 What drew me to wire wrapping, chainmaille, and other forms of physical/textural art expression was the hope that one day I would get to work with gemstones and rocks of all sorts. 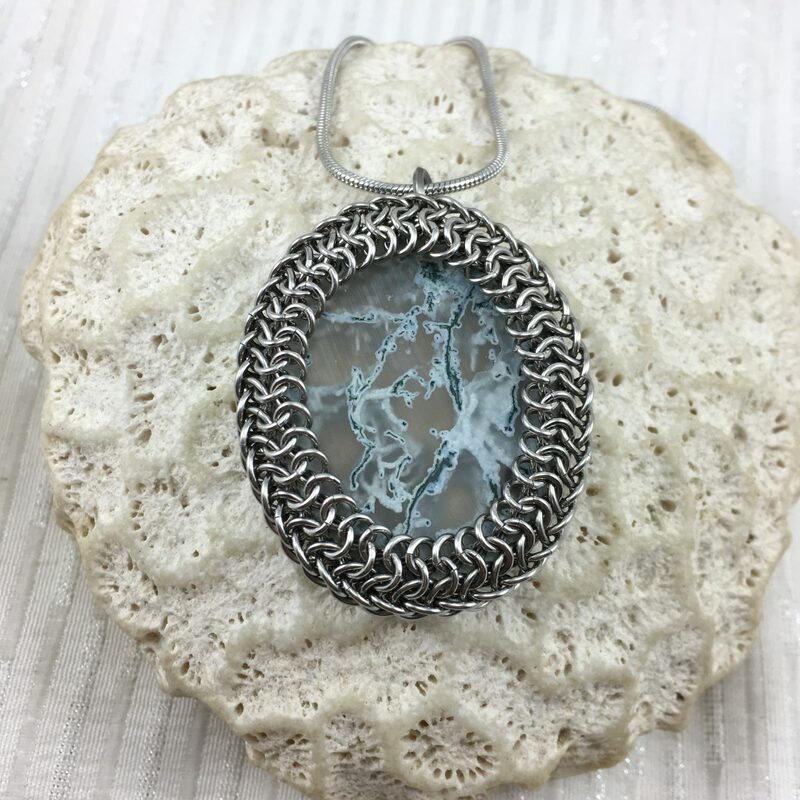 I have admired stone jewelry and art since I was a child and had a vast collection of both interesting and very “useless” rocks at an early age. Now, I collect rare stones and gems and hoard them like a dragon! Oh, and put them in beautiful jewelry. That too. I was a child of nature and spent nearly 90% of my summers in the creek and the woods around us. I have a vast knowledge of native animals and took a special interest in reptiles and insects at a very young age. While other kids were in splash parks, I was splashing through the creek looking for neat animals to research, and stones to collect. It’s become a part of my artistic journey to use my art as fundraising for causes I believe in. Sometimes that cause is keeping my family afloat if I’m honest, but often my cause is native animal conservation and education, and the conservation of our wilderness. This is my favorite part of interviews! I take inspiration from anything, anywhere, at any time. 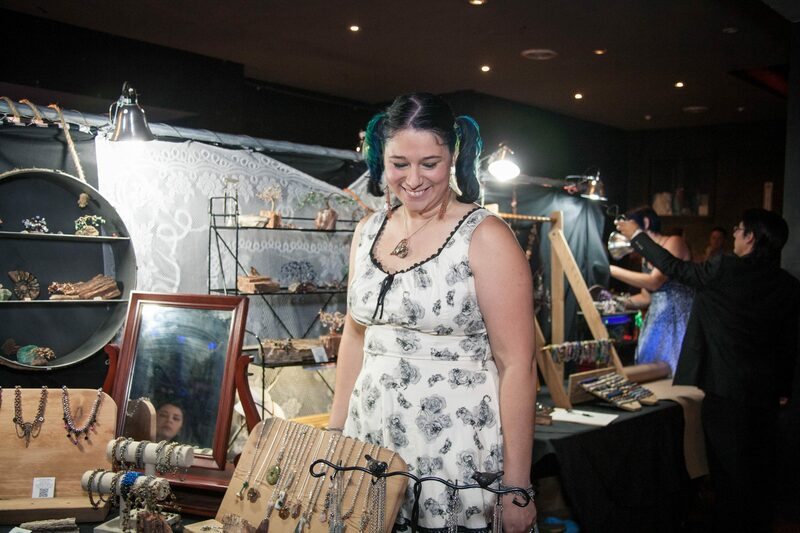 The majority of my creations are artisan designed jewelry. 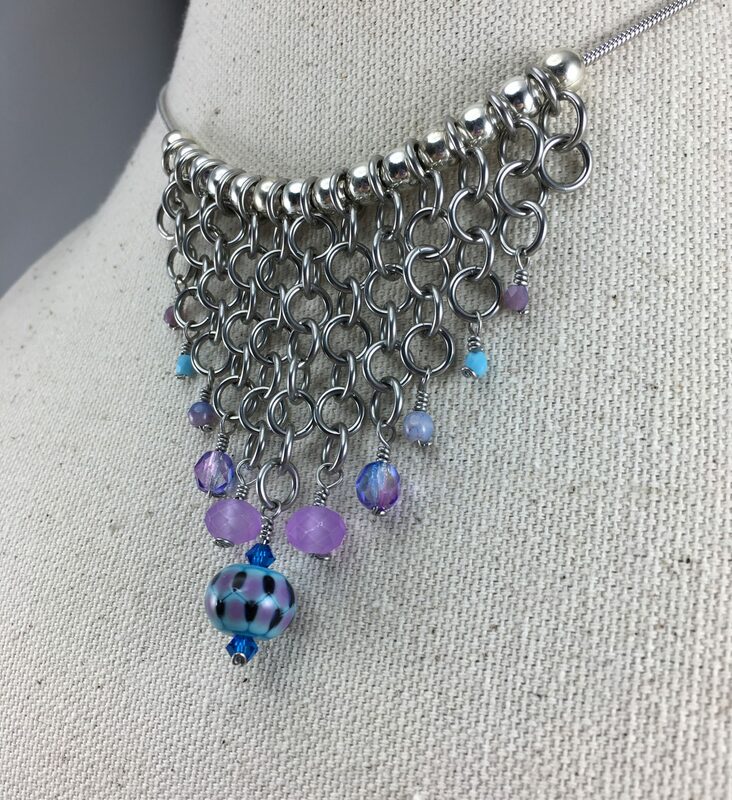 I love creating chainmaille made of anodized aluminum, stainless steel, copper, and brass. 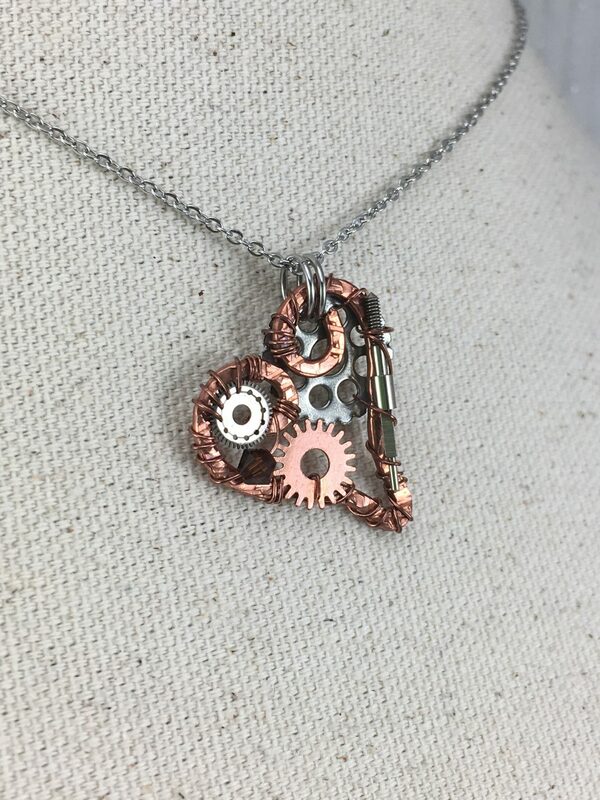 I also love creating wire wrapped pendants from glass beads, gemstones, unique “found” objects, or even recycled pieces from a customer’s broken jewelry, broken vase/vintage china, or even vintage brooches. I find myself drawn to rocks, minerals, fossils, and crystals more than other supplies. That doesn’t stop me from having an extensive collection of artisan-made lampwork glass beads and amazing pewter or pot metal charms on hand for fun designs. The other aspect of my art that I love more than anything is my home decor. Gemstone trees and recycled copper suncatchers are the large projects that bring me the most joy. I find myself in a Zen state when creating my gemstone trees or my copper suncatchers. I always tell my customers during shows, “I started making gemstone trees because I love rocks, and I wanted people to see rocks in a different way.” This is only partially true. Part two of the reason for creation: the prevalence of synthetic, dyed, and heat-treated stones being used to create gemstone trees. I love having the ability to create something that draws attention to the amazing beauty of stones and minerals in their natural state. I strive to create beautiful, semi-realistic tree sculptures. My first trees were for myself and as gifts, but the outpouring of joy at these beauties led me to pursue this path. 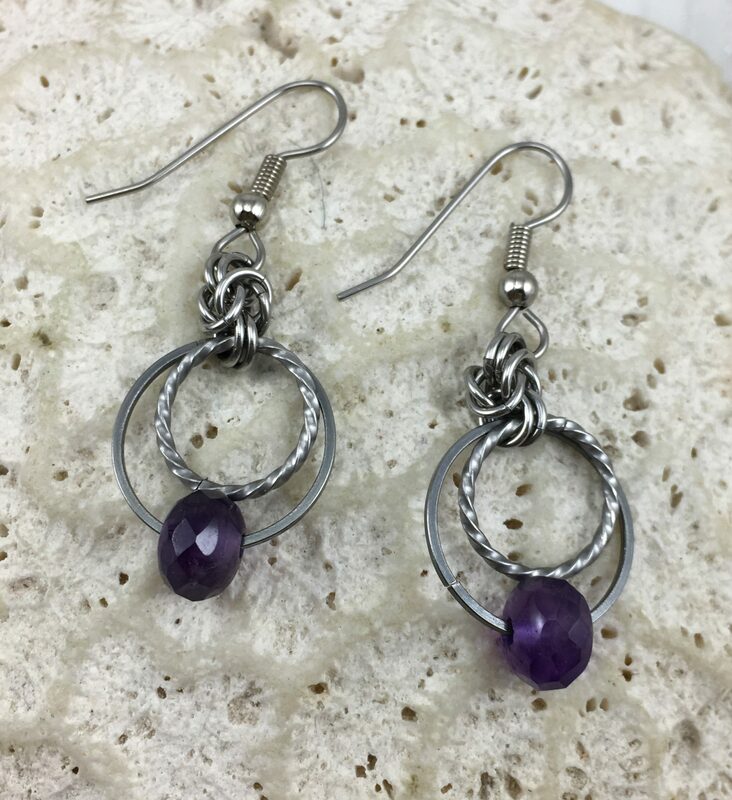 I discovered better ways to use the wire, better sources of gemstones, and discovered that I did not know everything about stones that I wanted to! 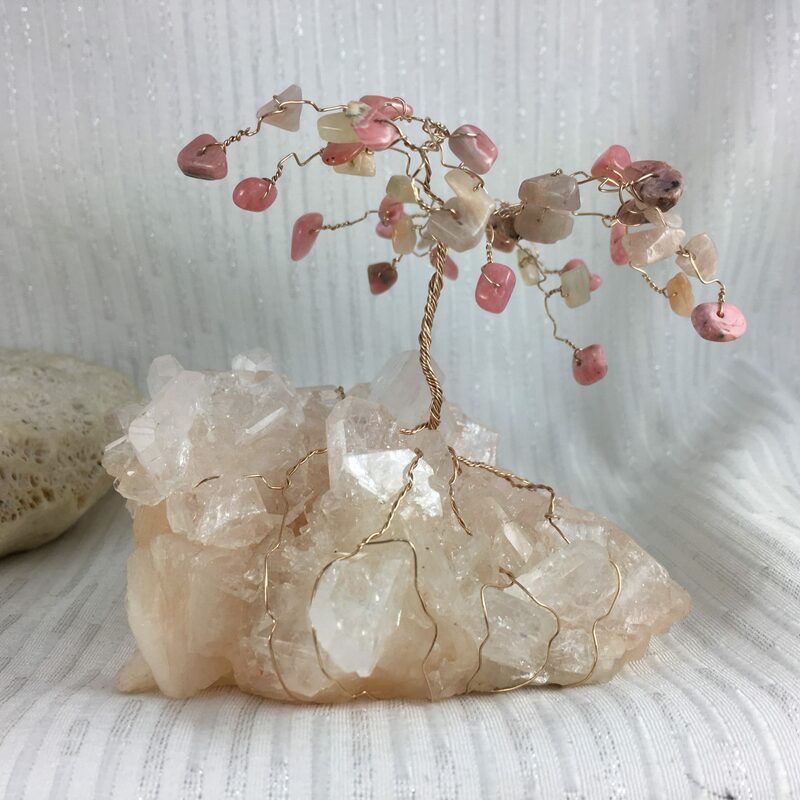 Truthfully, when I started making tree sculptures, I discovered that finding genuine gemstone chips is a challenge, especially for some of the rarer stones and minerals. I want people to look at my gemstone trees and be inspired and in awe of the amazing colors that nature can show us. With my suncatchers, I found that I am inspired by many things. I prefer using vintage, or vintage replica, chandelier crystals for my suncatchers. Some of my favorite pieces are the largest, most time-consuming works of art I have ever created! 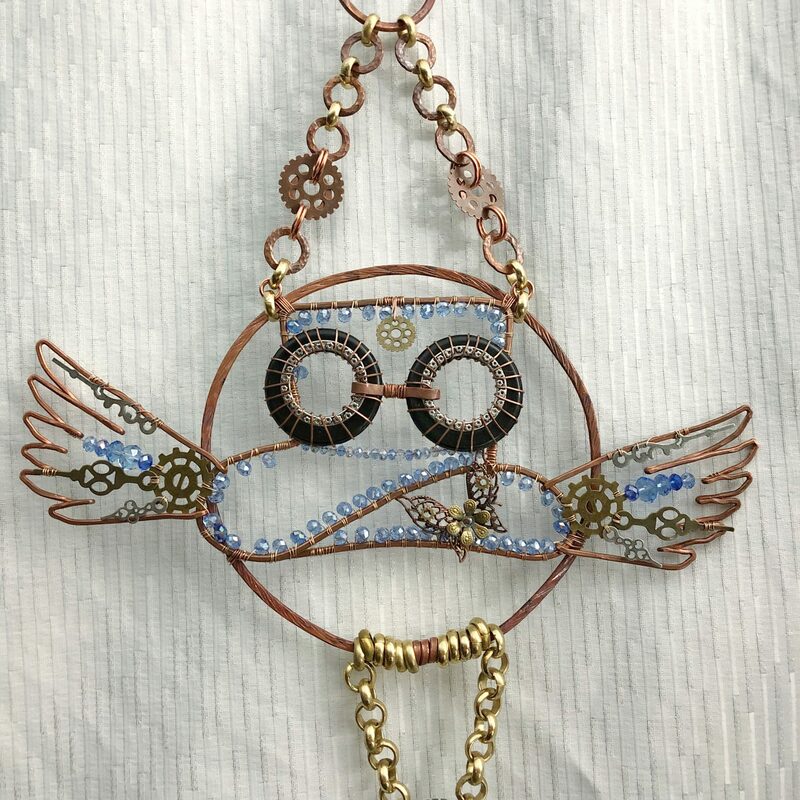 I use recycled copper wire for the frame and everything from reclaimed pieces of watches to agates to accent my pieces. 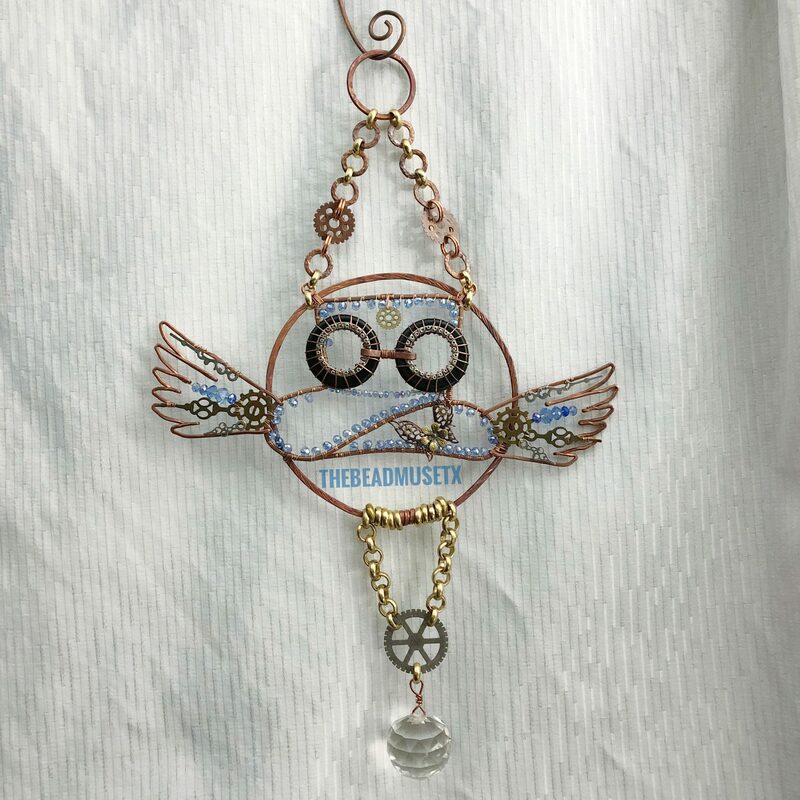 The Steampunk Juice logo that I recently created as a suncatcher is probably my favorite piece, with steampunk elements and recycled chain worked into it as well! 1) Don’t get frustrated by your mistakes. They are a way to learn. 2) Recycle everything you can! I keep a scrap bin for each kind of metal I use and drop the tidbits in there. I’ll find a way to recycle them into other jewelry or turn in the ones I can as scrap metal when the time comes. 3) Don’t copy. Don’t steal. It’s the worst thing that has ever happened to me. Being inspired by an artist doesn’t mean copying said artist. This goes for all forms of art. 5) Find a mentor. And if someone says they aren’t willing to teach you their techniques, don’t get mad. Often, people ask artists to teach them so that they can learn for free. This is unfair to the artist. Many of us are self-taught and came up with specific techniques for our art. There is a large percentage of artists that create beautifully written tutorials of their methods for new artists to learn from. These are invaluable and so worth the money you will spend on them. 6) If you like someone’s art and it’s out of your price range, it doesn’t matter! Let them know how much you love it! Share it with your friends! Artist to artist, it’s the most wonderful thing to see other artists loving my work as much as I love theirs. 7) Bartering and trading, when done correctly, is a much more legitimate and fun way of conducting business. But beware of the sharks, because they are always out there. Don’t barter and trade yourself out of business though! 8) YOU choose what you want to do. You can become a designer, document every step, and make them over and over again in different colors. Or you can be stubborn and hard-headed like me and refuse to make hundreds and hundreds of the exact same thing because you hate being a low-key manufacturer. It’s all up to you and your aspirations. Don’t let people bully you into being something you don’t want to be. 9) If you aren’t good at something, OUTSOURCE! It’s worth it to find people to help you move forward. I currently wear almost all of the “hats” of business, have two daughters, a dog, reptiles, and chickens, and I am overwhelmed often. I admit that wholeheartedly! An example of this is how I tried and tried to design a logo. I did a terrible job every time, so I finally reached out to another Houston resident that I met named Bunnith Thok, and he created a customized logo that I adore! 10) Find your happy sounds. For me, music (MUSE is a huge part of my life) or documentary shows/movies have been a huge part of my creative process. I was shattered when one of my favorite people to listen to, Anthony Bourdain, was announced as deceased. He has been a huge part of my art just by showing me humanity at its best and giving me worldly inspiration and insight that I wouldn’t have had before him. I’m grateful that I can still find and watch his shows when crafting, as they are thought-provoking and beautiful, just like art should be. There are a few ways people can find me! 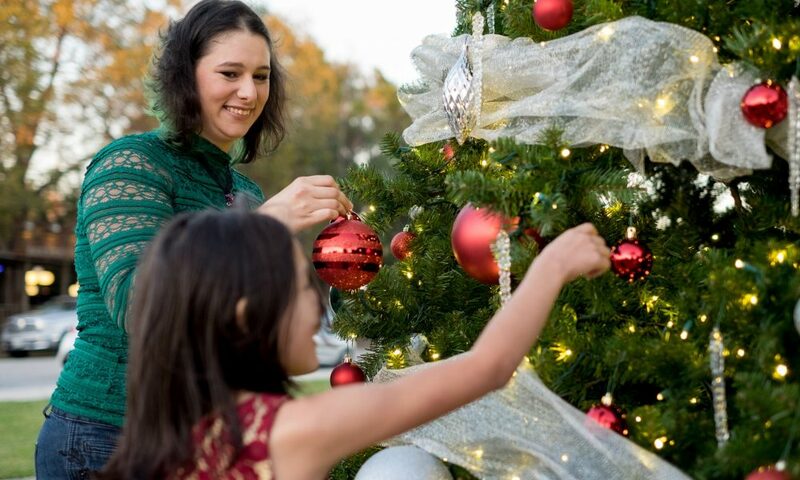 Want to see a Gemstone Tree in person? I currently have a small display in The Renewal Center of Tomball. They have a wonderful little cafe/juice bar/community center which has most of my gemstone trees and a handful of my artisan jewelry. 25% of my total sales in their space goes back to their community building efforts and to help them help others. Also, they make fantastic waffles and juice. I will be running my art table, and a fundraising table, at the next HERPS Reptile Show in Conroe. http://www.herpshow.net/conroe-tx/. I’m a huge supporter of local wildlife conservation, and I act as the voice of the slithery or scaly creatures in my neighborhood and surrounding areas. HERPS is a great marketplace for anyone looking for reptiles, as well as a great way to learn about all sorts of animals. You can get more information about the educational group I work with at https://www.facebook.com/TxRCO/ I also work with Riki’s Reptile Relocations to help limit the unnecessary deaths of reptiles in people’s yards. I love all your creations There are all beautiful. I just don’t use too much jewelry .